Johnny Blaze, Satana, Blade, and Hellstrom unite! Writer Victor Gischler and artist David Baldeón have spirit, yes they do. They’ve got spirit. How about you? More accurately, they have SPIRITS OF VENGEANCE coming at you! On October 4, the Marvel Universe’s most infernal characters join forces in this fiery five issue limited series. Back in the ‘90s, Marvel gave Ghost Rider and his horror-themed pals their own dark corner of the House of Ideas to play in. In addition to a series focusing on the Rider, the line also included a team-up called SPIRITS OF VENGEANCE that starred Johnny Blaze alongside another Rider, Danny Ketch. While this new series certainly acts as a spiritual successor to the original, readers need no familiarity with the original concept to enjoy the new series. We caught up with Gischler and Baldeón to speak about working inside the Marvel Legacy initiative, the new team’s origins, and exploring the darker parts of the Marvel Universe. Marvel.com: 1990s comic book fans will definitely recall the original SPIRITS OF VENGEANCE—how does it feel taking that title and using it to tell a new story as part of Marvel Legacy? Victor Gischler: It feels just fine. And if hitting those notes brings out readers who were fans in the ‘90s, then that’s awesome. But in no way are we approaching this book in a fashion that leaves out new readers. We’re looking forward. I guess it’s the best of both worlds. We’re taking some great characters who maybe haven’t gotten enough play in recent years and reintroducing them. 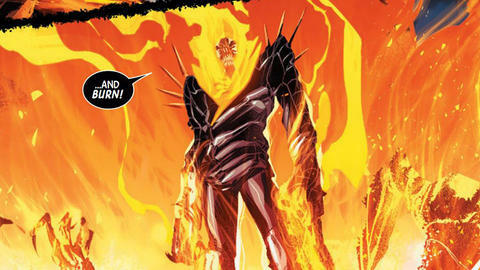 Marvel.com: So far we know that the series features Johnny Blaze as Ghost Rider, Satana, Blade, and Hellstrom. Victor, how did it feel to nail down this line-up? Victor Gischler: Not a chore at all really. There was some brief discussion with the editors about different possibilities, but it would have been cumbersome to fit in every character that might be in a book like this. I mean, it’s a five issue limited series. We got to make it a tight little team. The best and most obvious choices are the four you mentioned. Marvel.com: David, was there much of a redesign process when it came to these characters? David Baldeón: There’s a little bit of everything. As Victor says, we want to take the very best possible of the original title and its era, and look forward with that. Hopefully that comes through in the designs! With that in mind, in some cases, I have just had fun with the original look of the character, ran with it, and tried to give it a twist. In other cases, we’ve dug deeper to give new versions that still are true to the character’s core. And also following that line of thought of adding and moving forward rather than going just for repetition. There’s a lot of layers there, design-wise. Oh, and the antagonists! I’m so looking forward to everyone seeing them! Marvel.com: These characters have run into each other over the years—and they’ve even worked together. What brings them together this time around? Victor Gischler: They come together fairly organically. It’s not like S.H.I.E.L.D. had a meeting and said, “Hey, let’s invent a super hero team to fight bad guys.” Not this time. One of our heroes recognizes a threat and one thing leads to another. Marvel.com: How deep are you going into the supernatural and horror genres as you dive into these stories? Victor Gischler: We reach deep into some familiar mythos. Marvel.com: The classic SPIRITS OF VENGEANCE title and the Midnight Sons umbrella featured plenty of crossovers and guest appearances. Do you have plans to continue that tradition with this new series? Victor Gischler: Not at the moment, since it’s just five issues. We need to stay focused on our story and the four characters we already have to work with. But if there’s a call for more, there’s a huge potential for crossovers and other familiar faces. We’ll just have to see how it goes. Marvel.com: How has it been collaborating with each other to bring this group and this book to life? Victor Gischler: Pretty easy for me. I just sit back and watch David’s excellent art roll in. It’s going to knock your eyes out! David Baldeón: It’s a delight—pure and simple. I’m having the time of my life with this book and it is in great measure thanks to Victor’s amazing take on the characters. For instance, as fun as it is to “unleash” the Rider, the real joy is drawing Johnny Blaze as Victor writes him. Victor Gischler and David Baldeón delve into darkness with SPIRITS OF VENGEANCE #1, available October 4!